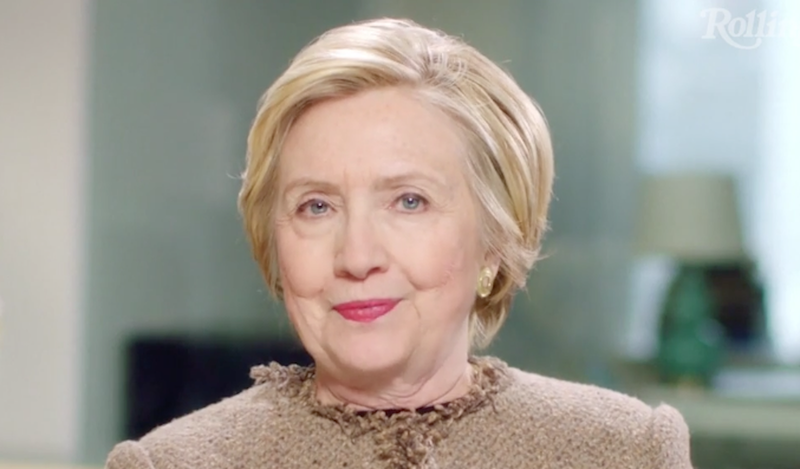 It’s been awhile since we’ve watched video of Hillary Clinton talking into the camera with her trademark calm, robotic cheer, and I didn’t realize how much I missed it until now. It was snidely noted by some that Clinton did not make an appearance at the Women’s March, though her former opponent Bernie Sanders did. Clinton’s presence at the demonstration would have had broader implications than general support, and I think she was wise to watch from home. But she was certainly there in spirit if the many “I’m With Her” signs floating through the crowd were any indication. This speech recorded for the 2017 Makers conference also indicates she stands behind the march 100 percent. Despite all the challenges we face, I remain convinced that yes, the future is female. Just look at the amazing energy we saw last month as women organized a march that galvanized millions of people all over our country and across the world. Now more than ever we need to stay focused on the theme of this year’s conference: be bold. We need strong women to step up and speak out. We need you to dare greatly and lead boldly. So please, set an example for every women and girl out there who’s worried about what the future holds and wonders whether our rights, opportunities and values will endure. And remember, you are the heroes and history makers, the glass ceiling breakers of the future. As I’ve said before, I’ll say again, never doubt that you are valuable and powerful and deserving of every chance and every opportunity in the world. That’s a good quote! In fact, it’s still pinned to the top of her Twitter feed. She should use it for a personal essay.